I was awakened at about 3 o’clock, a few mornings since, by a young man who said that he had lost the little finger of his right hand. The account given was as follows: being a clerk in the post-office, he was busy in assorting the mails. Having occasion to reach up to a high box or shelf, he stood upon a stool, and in the act of stepping down to the floor, a thin plain gold ring, upon the little finger of his right hand, caught in a sharp projecting hook used for the purpose of attaching mail bags. Oh dear. This can’t end well. Being thus for a moment suspended, as it were, by the ring, it cut its way, or, as the patient expressed it, whittled through the integuments of the finger, and finally separated the member at the last joint, the severed portion falling upon the floor, while the ring remained suspended upon the hook. A fellow clerk immediately picking it up, very nicely adjusted it, and bound round a handkerchief. His colleague replaced the severed finger in the hope that it might reunite with the stump. A forlorn hope, you might think; but there are a few cases on record in which a severed finger was successfully attached, even in the era before microsurgery. You’ll find one example here. About twenty minutes elapsed before I saw the patient. There having been no hemorrhage of consequence, and finding the parts in good apposition, I was desirous of seeing what nature might effect. Accordingly I merely applied strips of adhesive plaster, and bandaged. The next day, I found the patient very comfortable, having suffered little or no pain. Still giving him the benefit of a doubt, I concluded not to interfere with the dressings. Two days after the accident, however, I ventured to take a glance at the parts, and found the finger, as might have been expected, perfectly dead. Amputation was immediately performed, with the assistance of Dr. Minot, in the continuity of the first phalanx. 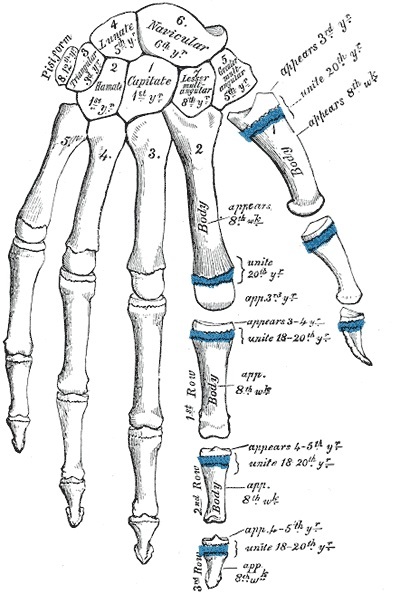 In other words, they cut through the knuckle, leaving the first (proximal) phalanx bone of the finger intact, with the second and third (intermediate and distal) amputated. On examination, I found that the ring had cut through the integuments upon the dorsal surface of the finger, commencing just below the second joint, laying bare the second phalanx throughout its entire circumference, and finally severing the last phalanx at the joint. …shows that the wearing of finger rings, “the history and poetry” of which has lately occupied the public attention, is not under all circumstances unattended by danger.